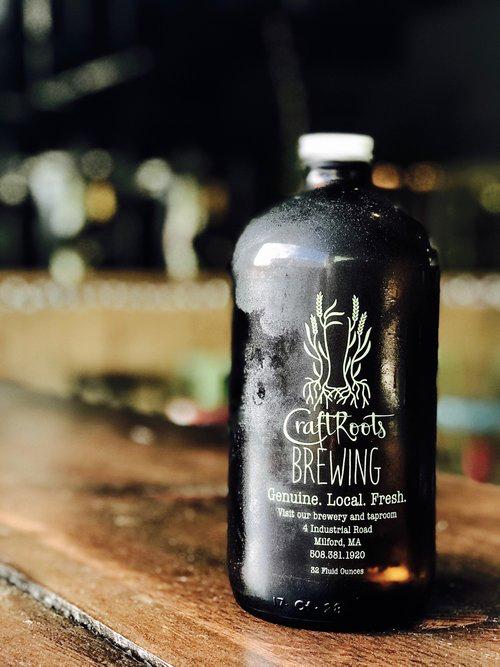 CraftRoots Brewing is grounded in a genuine grassroots idea: focus craft beer back to its field-to-glass origins. We source all of our craft malt from maltsters in the northeast. Yup, grown on small farms right here in New England…all of it. Most all of the hops we brew with are grown on a single family farm in western MA. Our beer has its roots in simple, down-to-earth relationships with these growers and artisans. Grown here, malted here, brewed here. Enjoyed wherever our beer takes you. Our taproom is a true labor of love and the perfect complement to our 7-barrel brewery. From the reclaimed bar top to the bright and vibrant paint and artwork, the space is a direct reflection of Maureen and Robin's vision. They've created an environment where people come to relax, enjoy a pint and spend time with friends. Life's hectic - we want you to escape the daily grind and unwind a little. Grab a seat at our 24-foot bar or at one of our handmade tables, order a fresh pint and catch a glimpse of our brewery in action. Can't make up your mind on which one of our eight draft beers to try? No problem. Go for our sampler rack and try four 5 oz. pours. Like what you're drinking? Be sure to order a 32 oz. squealer of your favorite beer to-go. Hungry? Feel free to bring in your own food. We also have menus featuring several local restaurants. Order for pick-up or delivery. We've recently added high-def television to our taproom for our guests to take in the big game. You'll now be able to follow your local sports teams while enjoying a pint! Looking to host a party? Ask about booking the OutShot, our event room adjacent to the taproom. See Event Space section below. Our taproom is adjacent to our 7-barrel brewery. The open feel of the taproom and brewery was a conscious choice by owners Maureen and Robin. They envisioned a space where beer lovers could see, hear and smell the activity in a bustling brewery. You can hear the fermenters actively bubbling away. Fragrant bags of malt from our local craft maltsters are right next to the taproom and corn hole game area. Take in the feel of a working brewery while you enjoy a pint and unwind. BYOF – We utilize the Bring Your Own concept when it comes to food. Feel free to treat your visit like a picnic to the park, but with beer! There are many options available for take-out or delivery as well, so feel free to indulge in Milford's culinary options during your visit to CraftRoots. FAMILY FRIENDLY – The taproom is a family-friendly environment and kids are welcome before 6pm on the weekends. At 6pm, we begin to follow a 21+ policy. After 6pm the taproom vibe is more a bar atmosphere and live music venue and not conducive to the younger set. NO DOGS – Sorry.. Unfortunately, we are not dog friendly. While service animals are welcome, your trusty companion will need to wait for you to return home. NO OUTSIDE ALCOHOL – While we do allow outside food to be brought in, the Town of Milford does not allow alcoholic beverages of any kind to be brought into our taproom. This includes wine, beer, and spirits. SQUEALERS– Most of our beer is initially available in squealers as well as draft. Check our Draft List for current squealer availability. In accordance with MA state law, we do not currently fill any squealers or growlers that are not our own. We do not allow filled squealers to be consumed on premise. See our Squealer FAQ for more info. LARGE GROUPS OR EVENTS – The OutShot room features space for 30 and provides plenty of room to serve food for your guests. For larger events, the taproom is available for rent when we are closed to the public (i.e., daily before 5pm as well as evenings on Monday, Tuesday and Sunday.) A Taproom Takeover is perfect for larger birthday parties, corporate events, etc. Use our Event space request page for further inquiry. Our riff on NE IPA, this beer is absolutely loaded with juicy, fruity gloriousness. Double-dryhopped with a seriously intense array of hops. Slightly revised each batch, these are the hop stars: Magnum and Nugget from Four Star plus Azacca , Citra and Mosaic. One sip and you'll want an encore!. Classic west-coast style IPA dry-hopped massively with CTZ hops for a piney, resiny and sticky hop finish. Yes, it's a double IPA per beer style guidelines but don't expect a hazy juicebomb NE DIPA. This one is clean, smooth and so drinkable. Dark as night, this dry stout is full of coffee notes from roasted barley. A generous amount of flaked barley gives it a soft mouthfeel. Nitrogenated for a creamy finish. A light and quenching brew. Somewhat tart, pomegranate flavor is subtle yet adds a dry fruitiness. It’s back!! Supremely drinkable IPA loaded with bright notes of citrus and grapefruit peel. Dryhopped generously with Mosaic and locally-grown Magnum hops. Brewed as always with a grist bill that’s 100% locally-grown barley, wheat and oats. American brown ale brewed with The Black Ale Project to benefit veterans in our community. The color of light cocoa, chock full of locally-sourced craft malt which brings notes of milk chocolate and toffee. Balanced with a dryhop addition of Cascade and Crystal hops from Four Star Farms as well as Hallertau Blanc hops. This is a true blue American brown ale rather than an English nut brown. We think this beer's namesake, Colonel Bragg (a US military man from Milford actively serving in the early 1800s) would approve. Just as our mission is about sustainability and locally-sourced ingredients, our distribution is intentionally local – we want the freshest beer available to our hyper-local community. The map below represents the draft and bottle accounts we currently support – look for our beers when you visit them and check back as we update this listing from time to time. Drink local.